1907/08 – 2º in Second Division. 1908/09 – 20º in First Division. 1924/25 – 1º in Second Division. 1934/35 – 21º in First Division. 1936/37 – 1º in Second Division. 1938/39 – 22º in First Division. 1953/54 – 1º in Second Division. 1954/55 – 21º in First Division. 1956/57 – 1º in Second Division. 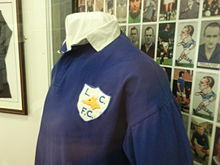 1968/69 – 21º in First Division. 1970/71 – 1º in Second Division. 1977/78 – 22º in First Division. 1979-80 – 1º in Second Division. 1980/81 – 21º in First Division. 1982-83 – 3º in Second Division. 1986-87 – 20º in First Division. 1993-94 – 4º in First Division. 1994-95 – 21º in Premier League. 1995-96 – 5º in First Division, vince i playoff. 2001-02 – 20º in Premier League. 2002-03 – 2º in First Division. 2003-04 – 18º in Premier League. ^ (EN) The History of Filbert Street, su filbertstreet.net.